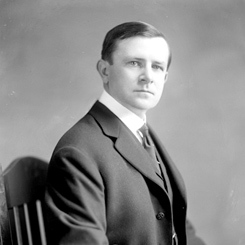 Image courtesy of Library of Congress Born and educated in Massachusetts, Representative Joseph Walsh practiced law, reported for a Boston newspaper, and worked in the New Bedford fishing industry before commencing his political career in 1905. Absent a quorum, the House conducted business in the midst of the 1918 “Spanish” influenza pandemic. A wave of flu cases swept the District of Columbia beginning in late September, leaving Speaker Champ Clark of Missouri and Majority Leader Claude Kitchin of North Carolina bedridden. Within days, many Representatives were absent because they were ill or tending to sickened family members. The District, swelled by an influx of wartime workers, was hit hard. By early October hundreds of deaths were reported weekly. The House operated only for limited pro forma sessions and the chamber’s galleries were shuttered. Aside from Members who’d fallen ill, others were traveling to support Liberty War Bond drives or were back in their districts campaigning for the fall elections. The House tried to undertake normal legislative business on October 14 to consider a bill to establish a Public Health Service (PHS) reserve corps composed of military health personnel who could be deployed around the country to alleviate the crushing demand for doctors in influenza hotspots—with an eye toward future medical emergencies. But when Representative Martin Madden of Illinois moved that an insufficient number of Members were present, the ensuing quorum call revealed that 251 Representatives were indeed absent. The following day, the House again took up the PHS reserve corps bill with less than 50 Members in attendance. But those present reached a gentlemen’s agreement—a “modus vivendi” as a recuperated Speaker Clark explained from the rostrum—to consider the bill under unanimous consent without anyone raising a point of order that a quorum was not present. Representative Joseph Walsh of Massachusetts initially demanded a quorum call but was persuaded by other Members to withdraw his request. Debate on the reserve corps bill lasted four hours, before an amended measure passed without objection. Immediately afterward, Representative Walsh made a point of order that a quorum was not present; the House adjourned for the day.